If you have suffered chimney damage, give G&A Cardiff a call, we repair all types of chimney stacks, our highly skilled roofer is fully trained chimney in work, we also fit chimney pots, re-pointing and lead flashings, call our emergency roofer now for prompt chimney repairs. Has your Guttering Seen Better days, do They Leak or are they Damaged? Your gutters are there fof a good reason, they are there to catch the rain water from your roof, if your guttering leaks or is damaged your home or property in in danger of water damage, for prompt or emergency gutter work , call our roofers today for a fast solution and repairs. 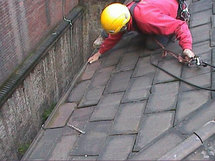 If your flat roof has been leaking for some time, its best get at least a tempory repairs, leaking flat roofs can rot the timbers over time and if this happens the coat to repair this could be huge, let our flat roofer assess your roof right a way. This entry was posted in Emergency Roofer and tagged Cardiff, emergency, roofer. Bookmark the permalink.